50 Proofs for the Bible – N.T. Twelve page pullout. 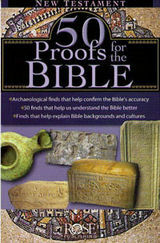 Archaeological finds that help confirm the Bible’s accuracy. 50 finds that help us understand the Bible better. Finds that explain Bible backgrounds and cultures.